Been out of touch for some time now. But I am back with a new find, Vedic Line Face Wash - Sandalwood & Turmeric. I came across this brand on urbantouch.com while shopping online (one of my most trusted sites, which has never disappointed me). Anyways, my Lakme fruit face wash was getting over and I wanted to try something new, so I thought of ordering this face wash.
What the face wash bottle says: Face Wash formulated specially for normal to dry and mature skin. 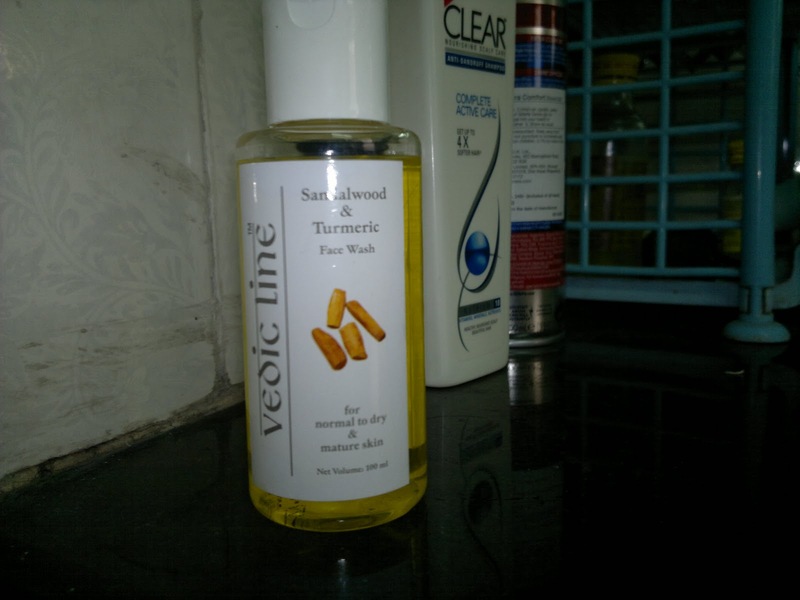 Well, I have normal to dry skin in winters, so I thought lets give this a try. Quantity I ordered: 100ml (also available in a pump packaging for 200 ml). The one I have has a flip top packing, which is convinient to open. Price: 100/- originally, but I got it for 90/-. Ingredient list: didnot type but took a pick for you. Best thing, doesn't contain parabens!!! 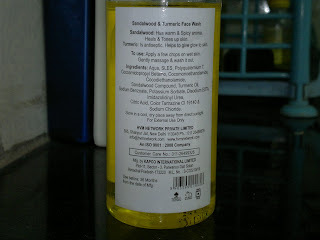 My experience with this face wash: I have been using this for a week now, so I thought of reviewing it as well. As you can see, the from the swatch, the face wash is pale yellow in color, and it lathers up nicely into a very soft foam. It has a slight gel like consistency (not to firm, neither too runny). The fragrance according to my experience is mild spicy but pleasant. My mom found the smell quite good though. But the smell lasts till you use the face wash and doesn't linger for long. Now, coming to the cleansing properties, the face wash does a decent job in cleaning your face but would nit remove impurities. 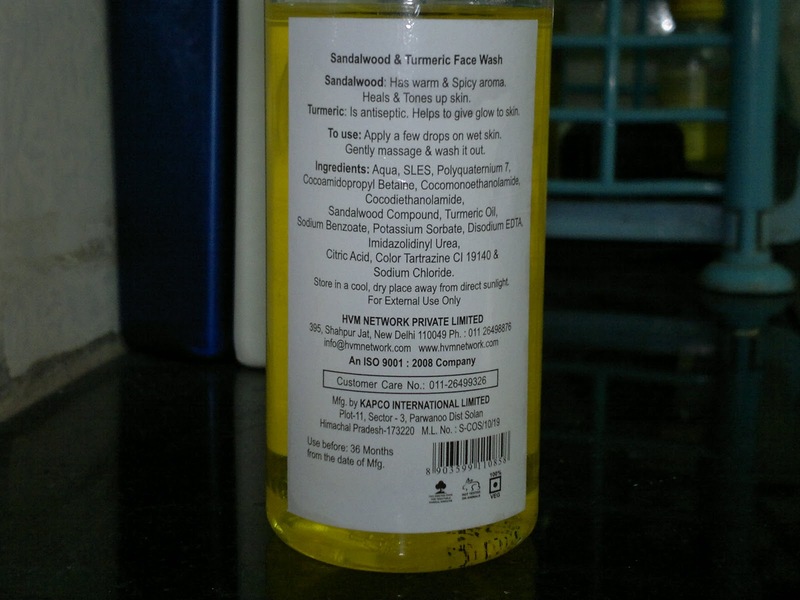 Also, it is the gentlest face wash I have used till date. It does not dry out your skin, but it cleans it. But since it is winters here, I do use a moisturizer after using this. Would I say, it is my HG face wash. I think no, because I am always looking for a change and I think you should not stick around with the same product for too long, as the effectiveness is reduced with prolonged usage. Overall, nothing fancy, but a good facewash. Thanks for reading people. Everyone here is warming up for the upcoming christmas! !